In addition to the recently announced lineup of Samsung Chromebooks, Google Advertising has found another new way to market these devices to consumers. According to recent reports, Google is now trying to sell Chromebooks to the notebook section of users, emphasizing enterprise use in its earlier incarnations. 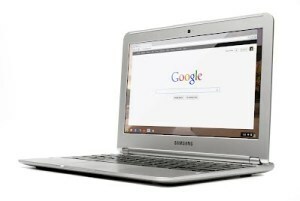 Google’s Chromebook, even with a company like Samsung behind it, is a hard thing to get consumers excited about. The device runs Google’s Chrome operating system as opposed to Windows or Mac OS X, operating systems that most people are very comfortable using. The Chromebook also emphasizes cloud services instead of running applications from and saving things to the computer’s hard drive. This is where people get wary because, let’s be honest, a lot of people fear change. The only plus with these new devices is that they no longer require an active internet connection in order to be of any use. The corporate users were some of the first to brush off the Chromebook as an answer to their mobility needs. As a result, Google is now looking at the mass market. In doing so, the company has started a new television ad campaign that aims to appeal to families with the pitch line “for everyone”. The real question is, however, will the Chromebook have any more luck with consumers on its second run through the market? The major hurdle for Chromebooks is that they are competing in a market that is currently dominated by tablets. Chromebooks do offer all the functionality and portability of things like Microsoft’s new Surface tablet, and at a far cheaper price, though people aren’t really interested in devices like this anymore. Even though an argument can be made that something like a Chromebook can provide access to cloud services like Microsoft Office Web Apps at a price below things like the new iPad Mini, it is still a hard sell to families who, traditionally, prefer to consume online entertainment via tablets instead of laptops. Source: ZDNet – Google now pitching Chromebook laptops to consumers. Will they want them? hello!i’m not sure where to post this, but as a date (14.07.) it maybe should be here.my os is wndiows 7 ultimate, chrome was my default browser, i think its version was 20.today when i launched chrome, i found all of my user data were gone – settings, bookmarks, extensions etc. the screen looked like if i have just downloaded chrome – and i hadn’t, it is my favorite browser and i use it for years now. i restarted chrome but it was all the same. then i decided to reinstall it – and i found that somehow my chrome was already uninstalled and the one i have launched is another, not installed by me chrome (i know it because there was a message that the target of my shortcut was missing)! how could that happen?? then, when i reinstalled it (from google.com/chrome), chrome was installed before to be installed its installer – so i could not choose the directory and chrome was installed in C; without restoring my data.sorry for my long comment; i’m not that familiar in such issues.i really, really hope everything will be ok. chrome is my favorite and i would like to keep it as such.thank you, and have a nice day! As soon as you mined the historical wealth from the Playground, you will have a conclusion to help make.